5. As a fifth point I must add also perseverance in prayer. Only he will receive, will find and will enter who perseveres in asking, seeking and knocking. It is not enough to ask Almighty God for certain graces for a month, a year, ten or even twenty years; we must never tire of asking. We must keep on asking until the very moment of death, and even in this prayer which shows our trust in God, we must join the thought of death to that of perseverance and say: "Although he should kill me, I will trust in Him"  and will trust Him to give me all I need. 3. To make the soul who receives it very careful indeed not to lose it----for people do not appreciate things that they can get quickly and with very little trouble. So, dear members of the Rosary Confraternity, persevere in asking Almighty God for all your needs, both spiritual and corporal, through the Most Holy Rosary. Most of all you should ask for Divine Wisdom which is an infinite Treasure: "(Wisdom) is an infinite treasure"  and there can be no possible doubt that you will receive it sooner or later----as long as you do not stop asking for it and do not lose courage in the middle of your journey. "Thou hast yet a great way to go." This means that you have a long way to go, there will be bad times to weather, many difficulties to overcome and many enemies to conquer before you will have stored up enough treasures of eternity, enough Our Fathers and Hail Marys with which to buy your way to Heaven and earn the beautiful crown which is waiting for each faithful Confraternity member. "(Let) no man take thy crown":  take care that your crown is not stolen by somebody who has been more faithful than you in saying the Holy Rosary. It is "thy crown"----Almighty God has chosen it for you and you have already won it halfway by means of the Rosaries that you have said well. Unfortunately someone else may get ahead of you in the race----someone who has worked harder and who has been more faithful might possibly win the crown that ought to be yours, paying for it by his Rosaries and good works. All this could really happen if you stand still on the beautiful path where you have been running so well: "You did run well." "Who hath hindered you?" Who is it who will have prevented you from having the Rosary crown? None other than the enemies of the Holy Rosary who are so numerous. Do believe me, only "the violent bear it away." These crowns are not for timid souls who are afraid of the world's taunts and threats, neither are they for the lazy and indolent who only say their Rosary carelessly, or hastily, just for the sake of getting it over with. The same applies to people who say it intermittently, as the spirit moves them. These crowns are not for cowards who lose heart and down their arms as soon as they see Hell let loose against the Holy Rosary. Dear Confraternity members: if you want to serve Jesus and Mary by saying the Rosary every day, you must be prepared for temptation: "When thou comest to the service of God . . . prepare thy soul for temptation." Heretics and licentious folk, "respectable" people of the world, persons of only surface piety as well as false prophets, hand in glove with your fallen nature and all Hell itself, will wage formidable battles against you in an endeavor to get you to give up this holy practice. To help you to be better armed against their onslaught I am going to tell you some of the things these people are always saying and thinking. This is to put you on your guard against them all, but not so much in the case of heretics and out-and-out licentious people, but particularly those who are "respectable" in the eyes of the world, and those who are devout (strange as it may seem) but have no use for the Holy Rosary. "What is it that this word sower would say?" "Come, let us oppress him, for he is against us." That is to say: "What is he doing saying so many Rosaries? What is it he is always mumbling? Such laziness! And what a waste of time to keep sliding those old beads along----he would do much better to work and not be bothered with this foolishness. I know what I'm talking about, . . .
"All you have to do, I suppose, is to say your Rosary, and a fortune will fall from Heaven into your lap! The Rosary gives you everything you need without your lifting a finger! But hasn't it been said: "God helps those who help themselves?" There's no need then of getting mixed up with so many prayers. 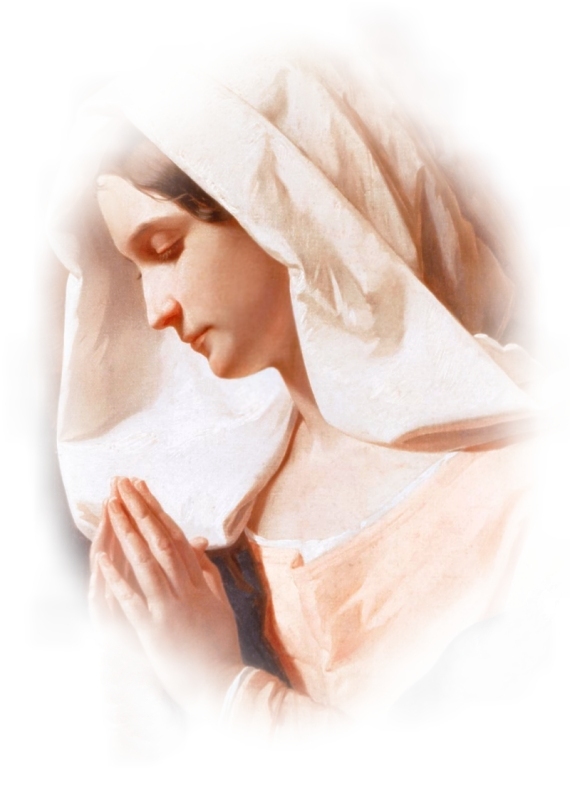 "A brief prayer is heard in Heaven," one Our Father and Hail Mary will do provided they are well said. "God has never told us to say the Rosary----of course it's all right, it's not a bad devotion when you've got the time. But don't think for one minute that people who say the Rosary are any more sure of Heaven than we are. Just look at the Saints who never said it! Far too many people want to make everybody see through their own eyes: folk who carry everything to extremes, scrupulous people who see sin almost everywhere, making sweeping statements and saying that all those who don't say the Rosary will go to Hell. "Oh yes, the Rosary is all right for old women who can't read. But surely the Little Office of Our Lady is much more worthwhile than the Rosary? Or the Seven Penitential Psalms? And how could anything be more beautiful than the Psalms which are inspired by the Holy Ghost? You say you have agreed to say the Rosary every day; this is nothing but a fire of straw----you know very well it won't last! Wouldn't it be better to undertake less and to be more faithful about it? "Come on, my friend, take my word for it, say your morning and night prayers, work hard during the day and offer it up----God doesn't ask any more of you than this. Of course you've got your living to earn; if you were a man of leisure I shouldn't say anything----you could say as many Rosaries as you like then. But as for now, say your Rosary on Sundays and Holy Days when you have lots of time, if you really must say it. "But really and truly----what are you doing with an enormous pair of beads? You look like an old woman instead of a man! I've seen a little Rosary of only one decade----it's just as good as one of fifteen decades. What on earth are you wearing it on your belt for, fanatic that you are? Why don't you go the whole way and wear it around your neck like the Spaniards? They carry an enormous Rosary in one hand---and a dagger in the other. "For goodness sake drop those external devotions; real devotion is in the heart . . . etc. etc. . . ."
Similarly, not a few clever people and learned scholars may occasionally try to dissuade you from saying the Rosary (but they are, of course, proud and self willed). They would rather encourage you to say the Seven Penitential Psalms or some other prayers. If a good confessor has given you a Rosary for your penance and has told you to say it every day for a fortnight or a month, all you have to do to get your penance changed to prayers, fasts, Masses or alms, is to go to confession to one of these others. If you consult certain people in the world who lead lives of prayer, but who have never tried the Rosary, they will not only not encourage it but will turn people away from it to get them to learn contemplation----just as though the Holy Rosary and contemplation were incompatible, just as if all the Saints who have been devoted to the Rosary had not enjoyed the heights of sublime contemplation. Your nearest enemies will attack you all the more cruelly because you are so close to them. I am speaking of the powers of your soul and your bodily senses----these are distractions of the mind, distress and uncertainty of the will, dryness of the heart, exhaustion and illnesses of the body----all these will combine with the devil to say to you: "Stop saying your Rosary; that is what is giving you such a headache! Give it up; there is no obligation under pain of sin. If you must say it, say only part of it; the difficulties that you are having over it are a sign that Almighty God does not want you to say it. You can finish it tomorrow when you are more in the mood, etc. . . . etc. . . ."
Finally, my dear Brother, the Daily Rosary has so many enemies that I look upon the grace of persevering in it until death as one of the greatest favors Almighty God can give us.